The non-profit Graycliff Conservancy, Inc. was founded in 1997 to acquire, preserve, and restore the Frank Lloyd Wright-designed Graycliff Estate. 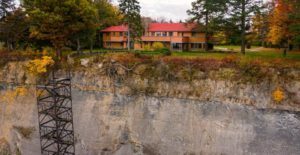 The Conservancy has been working for well over a decade to restore the eight and a half-acre estate on the shore of Lake Erie, all the while offering public tours and educational events. Frank Lloyd Wright (1867-1959) was one of the most important figures in 20th century architecture and design. His genius is marked by his vision to create a new form of American architecture based on the open landscape of the Midwestern Prairie. Wright redefined traditional concepts of space by physically and spiritually connecting the built environment to the natural world. He is best known for his “prairie style” homes, efficient office buildings, and innovative furniture and decorative designs. 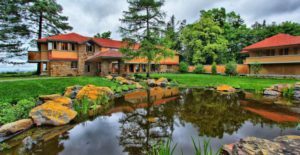 In late 2018, it was announced Graycliff Estate has been restored to its original splendor with the completion of a year-long extensive restoration project. The $4,047,000 project, which was supported by New York Governor Cuomo‘s $3.7 million in Buffalo Billion II regional revitalization funding, includes complete interior restoration of both the Isabelle Martin House and the Foster House, landscaping improvements and a reconstructed beach access. The interior restoration of this New York State Landmark project builds on the $6 million exterior renovations previously completed by the Graycliff Conservancy. Graycliff was designed by Wright between 1926-1931 for Isabelle R. Martin, wife of industrialist Darwin Martin, as a summer home for the family on the bluffs above Lake Erie. The Graycliff property, located at 6472 Old Lakeshore Road in Derby, now looks as it did when it was completed back in 1931. At that time, it was built with materials found on the site; the fireplace is composed of rocks that fell from the cliffs and the plaster for the walls was created with sand from the beach. The latest restoration effort includes new plumbing and heating systems, electrical work and a fire suppression system. Once work on the buildings’ systems was complete, 8,000 square feet of walls were re-plastered, woodwork was restored and a shine was added to floors and hardware. With interior restoration complete, Graycliff will shift its focus to restoring the historic landscape, returning access to the beach side tower and adding a pavilion that will serve as a Visitor and Interpretive Center. The center will feature historical exhibits, multimedia experiences and other interactive amenities that bring the many stories of Graycliff to life. The center is expected to open in 2020. Phase 0: This included planning as well as removal of non-historic buildings. Much work was completed volunteers. Phase I: The first steps of actual restoration took place, as well as the creation of an attractive, handicapped-accessible Visitor Pavilion. Phase II: Restoration continued removal of non-historic buildings, installation of handicapped-accessible walkways, and several masonry restoration projects. Phase IIIA: Phase III was the most significant phase of restoration of Graycliff, from 2006-2008. Phase IIIB: Restoration of Graycliff continued from 2007 thru 2009 in this phase of restoration, which included windows and doors, the North Terrace of the Isabelle R. Martin House; and extensive work on the Foster House including asbestos abatement, installation of a state-of-the-art misting fire protection system in this building, and exterior stucco restoration. Phase IV: Graycliff’s 8.5 acres of historic landscape is as important historically as its buildings. Recognized nationally by the Cultural Landscape Foundation for its work to restore and preserve Graycliff’s historic landscape, the Conservancy has completed Phase I, the most difficult phase of landscape restoration. Phase V: Interior work completed to date includes two important projects: The restoration of the Sun Porch used by the Martin Family; and restoration of floors in the entry way, living room and dining room, as well as fire suppression in these areas. Phase VI: The restoration of historic furnishings, is progressing behind the scenes. Thanks to prestigious national funding from the National Endowment for the Humanities and the National Trust for Historic Preservation, the Graycliff Historic Report and Collections Assessment was recently completed. This research, by Pamela Kirschner and Scott Perkins, will inform the Conservancy’s efforts to accurately furnish the interiors and care for the collection. Phase VII: Through the generous support of the State of New York and the next investments in the Buffalo Billion, Empire State Development and many generous private donors are combining to invest over $4 million in the final phase of Graycliff restoration, including the interiors of both houses, select landscape projects, and restoring access to the beach via a stair tower. All photos courtesy of Graycliff Conservancy, Inc.
Watch 2-minute video about the restoration.